Big for a Day Activity: Show me the science! On Saturday, April 10, Big Sister partnered with Science Club for Girls and the Simmons College Institute for Leadership and Change to present “Show Me the Science!” at Simmons’ Alumnae Hall. This unique event was formatted as a “reverse science fair,” where girls got to explore various STEM-related (Science, Technology, Engineering, and Mathematics) demonstrations. Twenty-three girls who are currently waiting to be matched with a Big Sister through Big attended the fair with a Big for a Day volunteer. The interactive demonstrations kicked off with a session led by Terry Murray, “The Inventor Mentor,” an MIT-trained mechanical engineer and inventor. Terry used items found around the house, such as electrical tape, soda bottles, and tire pumps, to demonstrate how physics works (and how to make a pretty cool rocket launcher!) Other activities included optical illusions and how they affect the brain presented by Women in Science at Harvard-Radcliffe; engineering concepts using “dancing pasta”—pasta dropped into a solution of baking soda, vinegar, and water—with engineers from Raytheon; and creating bacteria in Jell-o (which the girls got to take home with them) as a means of finding new antibiotics, which was demonstrated by women from Cubist Pharmaceuticals. 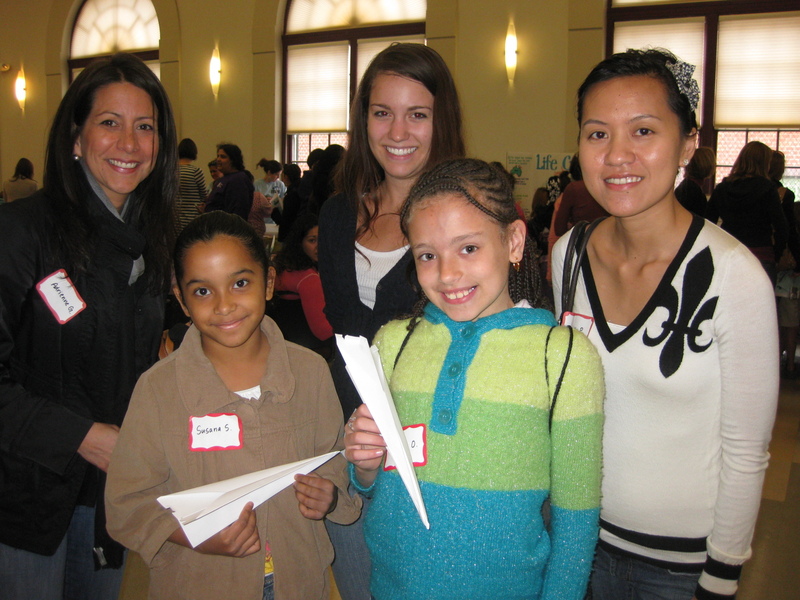 The activities were a great, engaging way to expose the girls to STEM careers and woman who are actually in them. Big thanks to Science Club for Girls and Simmons for giving our girls the opportunity to explore practical applications of science and maybe even sparking some career aspirations! Gender matters. Big Sister has always known the important role that gender plays in mentoring, and now we have the research to prove it. More than 50 practitioners and funders gathered at Bank of New York Mellon on Friday, March 26, to hear nationally known researchers, Dr. Jean Rhodes of UMASS Donahue Institute, and Dr. Renee Spencer of Boston University’s School of Social Work, share the findings of their respective studies on the role of gender in mentoring. The event, Getting Results: Why Gender Matters in Mentoring, was hosted by Bank of New York Mellon and Big Sister Association of Greater Boston in partnership with The Girls’ Coalition of Greater Boston, and included a community dialogue facilitated by Dr. Deborah Prothrow-Stith. Click here to read Mass Mentoring Partnership’s blog entry about the event! Read more about Rhodes’ and Spencer’s research here.